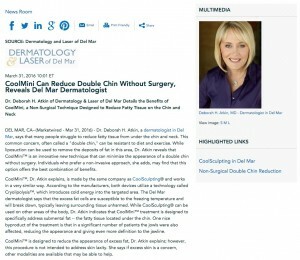 Dr. Deborah H. Atkin of Dermatology & Laser of Del Mar details the benefits of CoolMini™, a non-surgical technique designed to reduce fatty tissue on the chin and neck. Del Mar, CA — Dr. Deborah H. Atkin, a dermatologist in Del Mar, says that many people struggle to reduce fatty tissue from under the chin and neck. This common concern, often called a “double chin,” can be resistant to diet and exercise. While liposuction can be used to remove the deposits of fat in this area, Dr. Atkin reveals that CoolMini™ is an innovative new technique that can minimize the appearance of a double chin without surgery. Individuals who prefer a non-invasive approach, she adds, may find that this option offers the best combination of benefits. CoolMini™, Dr. Atkin explains, is made by the same company as CoolSculpting® and works in a very similar way. According to the manufacturers, both devices utilize a technology called Cryolipolysis™, which introduces cold energy into the targeted area. The Del Mar dermatologist says that the excess fat cells are susceptible to the freezing temperature and will break down, typically leaving surrounding tissue unharmed. While CoolSculpting® can be used on other areas of the body, Dr. Atkin indicates that CoolMini™ treatment is designed to specifically address submental fat—the fatty tissue located under the chin. One nice byproduct of the treatment is that in a significant number of patients the jowls were also affected, reducing the appearance and giving even more definition to the jawline. CoolMini™ is designed to reduce the appearance of excess fat, Dr. Atkin explains; however, this procedure is not intended to address skin laxity. She says if excess skin is a concern, other modalities are available that may be able to help. Dr. Atkin suggests that patients considering treatment for a double chin should speak with a trusted medical professional such as a board certified dermatologist about their options. When diet and exercise fail to achieve the desired result, she says CoolMini™ may offer an alternative to invasive surgical procedures. 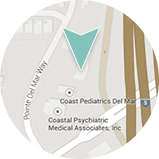 A practicing dermatologist in Del Mar for over 20 years, Dr. Deborah Atkin completed her undergraduate education at California State University, Northridge and the University of California, Santa Barbara. She went on to earn her medical degree from the University of California, Los Angeles, where she graduated with honors. Dr. Atkin completed additional medical training at the University of Arizona, Tucson and the Scripps Clinic and Research Foundation in San Diego. A medical philanthropist, she has volunteered at the African Medical Mission, the American Cancer Society, and the American Liver Foundation. Dr. Atkin and her son Nicholas Wallace, a liver transplant recipient, have established a 501C3 charity, Nick’s Picks. The charity delivers fun-filled backpacks full of activities and comfort items to hospitalized and/or isolated children across the United States. Dr. Atkin is available for interview upon request.